Hurrah! After all the hints of the past few months I can confirm that the Society for One-Place Studies is born. I seem to have ended up as Vice Chairman. Do look, do join if you too are researching the history of a place. This is going to be a good way to exchange ideas and encourage each other. Yes, this does mean that I have been instrumental in the launching of two societies in a month – so much for a quiet life. The Buckland Brewer History Group website is developing nicely and we have had a great deal of interest from near and far. Spent some time this week searching for the Braund Society journal, which had in theory been delivered to an outbuilding near me. Outbuildings duly searched and no sign. Eventually the parcel was tracked down. The relief delivery driver used his sat nav (always a bad idea if you are trying to find my house) and then dumped the parcel in the nearest shed, which just happened to be that of a neighbour who was on holiday. The regular driver, refreshed from his break, after consultations with his colleague and identifying sheds on Google Earth, retrieved it. Had a new one in the seventeenth century this week. I had enlisted a willing (well probably not so willing) victim volunteer, to pose as a cavalry officer. I was about to place a Monmouth cap (knitted beany hat affair) on his head, which was somewhat follicly challenged, when he tells me he is allergic to wool! So straight to the helmet then – one has to suffer for one’s art – or at least he did. Some TV ties ins now. Disappointed to find that Celebrity Masterchef’s ‘Wars of the Roses’ menu included orange carrots. Thanks to Martha for picking that one up – to say nothing of the not very historic plastic stock pots. Impressed though by Nick Hewer’s apparent fluency in reading seventeenth century documents during his episode of Who Do You Think You Are? Was there really a nicely transcribed copy nearby? I rather think there may have been. Finally I must mention the heavily hyped Soldiers’ Wills site. Great resource but the site leaves a lot to be desired. They need to include a proper explanation of the class of records. It also needs the facility to search a range of dates, currently it is one year at a time. The full date span on the advanced search is 1850-1986. It seems the only dates in use at present are 1914-1921 but if it tells you that, it isn’t anywhere very prominent. Just glad I didn’t search 1850-1986 a year at a time for all the Braunds! This is really only set up for an individual family historian looking for a single will at present. What about us One Place Studiers? I’d also like to have been able to tell them all this but my and several others’, feedback emails bounced! Second attempt at feeding back was more successful and the wills arrived on my computer within two days – shame one was mis-indexed though. 2 Comments Posted in Uncategorized Tagged 1646, BBHG, Braund Society, One Place Studies, Soldiers' Wills, Who Do You Think You Are? 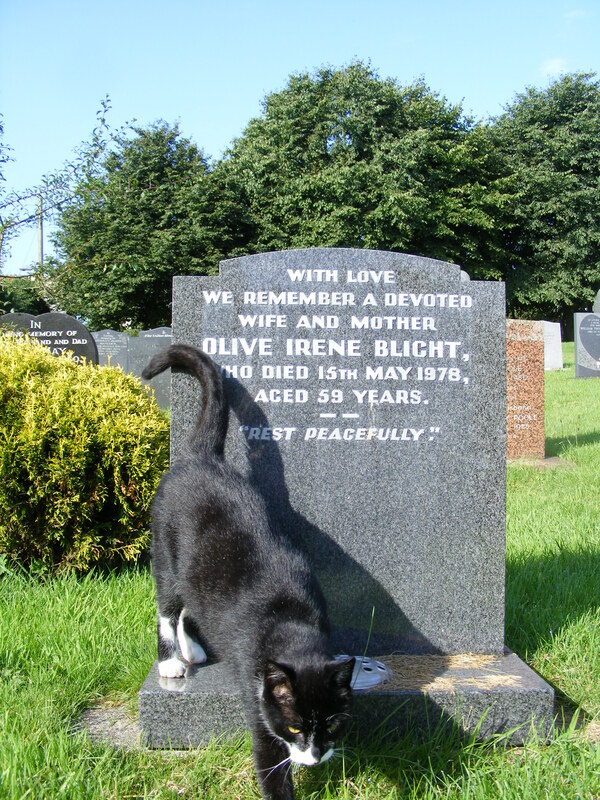 Mole Traps, Moggies and Morning Dew: the hazards of photographing gravestones. I am finally catching up with last year’s jobs and finishing off the last few gravestone photos to go with the Buried in Buckland project. I have long since established that this needs to be a morning job as the sun is at the wrong angle for afternoon photography. 6.30am and there is thick fog over Buckland Brewer. I proof-read my way through the ‘B’s of Family Historian’s Enquire Within and then venture out into the morning dew. Rather a lot of morning dew actually – feet and sandals now soaked (not the new blue sandals of the previous post.). It’s jolly hazardous this gravestone photographing you know. Not only do you have to negotiate Ernie’s mole traps, there is the continual getting up and squatting down to be level with the stone in question. The latter activity means that I have now been squatting down in long dewy grass and I look as if I have had an unfortunate accident. Then, what do you know, today’s chosen rows of stones include a significant number that face the wrong way. These are afternoon stones – typical. I clean mown grass off Cyril Metherall and remove numerous dead floral tributes out the way in order to get the best view. Then I encounter the local cat who refuses to move from in front of Olive Blight. Gratified to see that the latest episode of Who Do You Think You Are? with Gary Linekar, was filmed in Hinckley, location of the forthcoming Exodus Conference (mentioned in my previous post). Not only that but he shares with my children the distinction of being descended from a poacher. It seems I am now Chairman of the Buckland Brewer History Group steering committee – how did that happen? Speakers to book, web pages to create, burials to index. I know, I am supposed to have finished indexing the burials. As a result of an administrative error when backing up my computer (alright, I admit it, I overwrote the new file with the old one), I now have 1741-1782 to redo. Next stop marriages. I was feeling pleased with myself that I seemed to have managed to set up an email account for the above society. Obviously lulled into a false sense of security though. They want a mobile phone number to send a verification to. I do have a mobile phone – somewhere. The number errr now that’s another matter. Pretty pleased with our shiny new baby website for the group. It’s just a shame I should have been doing something else when I was playing at getting the webpages together. War Memorial Inscriptions now added to our Buried In Buckland pages. Where have I been? You may wonder. So do I – surely it should be about April and here we are August coming to an end. No sign yet of the ‘less hectic’ year that I promised myself. I have been buried in visits from family and friends, always good fun. My children get me into untold scrapes. First a fairly pregnant Rebecca and I undertake a mad scramble across the rocks at Croyde. I have nobly leant her my brand new, ridiculously expensive, sandals on the grounds that they are blue and she is wearing blue. Keen as I am for her not to tear her feet to pieces on sharp rocks, I am not so keen on her getting the sandals covered in sandy salt water. Could I make my way across the rocks and throw the old sandals back to her? Could we wear one old and one new sandal each and hop? The whole process would be much easier if we weren’t laughing so much. We emerge relatively unscathed. Then Martha and I get ourselves trapped in a local budget supermarket beginning with L. We are there to buy flowers. We enter with our basket. The flowers are outside. As we try to go back to the entrance, past the no entry sign the basket sets off the shop alarm. Even the empty baskets are alarmed here – what does that say about the residents of this town (unnamed to protect the guilty)? Not to worry we will just go out the exit and go back round again. It seems impossible to get to an exit without buying anything and what we want to buy is past the exit arghhh. In the end Rob comes to the rescue by barging his way past numerous people who have been over indulging on Doritos, lager and chocolate (I know I looked in their baskets) and brings us back in the flowers so we can exit in the appropriate way – i.e. having parted with some money. Life in the seventeenth century continues, with now weekly visits from our friends at the local care home. We are working towards all their residents having enjoyed our peculiar brand of ‘fun’. If drilling holes in people’s heads and attacking them with pikes can be termed ‘fun’. One of our other young visitors, aged three, was very concerned that we didn’t seem to have any princesses with us. I might have pointed out that the princess of our time ended up incarcerated in Carisbrooke Castle under house arrest. Actually the young visitor was more concerned with telling me that she wanted to be Rapunzel when she grew up. There’s a career path. She also took well to pike drill with her mini pike. First time I’ve seen a pike wielded like a majorette’s baton. I ventured overseas (well outside Devon) to give a talk on seventeenth century gardens to Bude U3A. I usually appear in period attire for these, leaving enough of my twenty-first (well ok twentieth) century clothing underneath, so I can strip off at the end without offending anyone. It was awfully hot but I went for it, tucking my trousers in my socks so they didn‘t show under the seventeenth century petticoat (an outer garment for the uninitiated). Pity I forgot to un-tuck them before sauntering back across the car park afterwards. The talk went very well, if the fifteen minutes of questions was anything to go by. Martha did point out that this might be because I hadn’t explained things properly in the first place but it didn’t seem to be. An interesting Q & A session for the North Devon Group of Devon Family History Society and our 2014 programme is now nearly complete, with some fascinating presentations on the list. I’ve been revisiting a branch of my children’s ancestry, as we are planning a trip to south Devon and they came from that area. One individual, described as ‘an old offender’ seemed to spend every February being caught for salmon poaching. I am guessing it was a seasonal activity – something to do with spawning maybe. Thanks to the British Newspaper Archive, which I access via FindmyPast, I know all the gory details. Whilst on the subject of FindmyPast, I see they have added numerous Canadian resources. I hope that may help with my Devon emigrants research. I have also been running through (not with a weapon you understand – not in the C17th now) my chosen emigrant examples for the Exodus conference in a couple of weeks’ time. This means immersing myself in the history of the Bible Christian movement. In fact, much of my research time lately has been spent on Methodist related topics. I strive to understand the mind set of the people of the past – as all true family historians should. Why would a local Anglican Lord of the Manor continue to allow one of his properties to be used as a Methodist place of worship, whilst conducting an acrimonious exchange with another Methodist group in the local press? I have proof read a new edition of an excellent book and I have had discussions concerning a local chapel which may be used to combine evangelism and heritage – exciting times. Exciting times too on the local history/one place studies front. It’s a secret at the moment but do watch this space. Not a secret is the launch of Buckland Brewer History Group next month – first meeting on 18th September. Be there or be something or other. A thick sea mist today, so leaving early to avoid the heat wasn’t really necessary. A bit of a detour trying, unsuccessfully, to find free parking in Salcombe. Better luck in Hope Cove, where today’s walk starts. 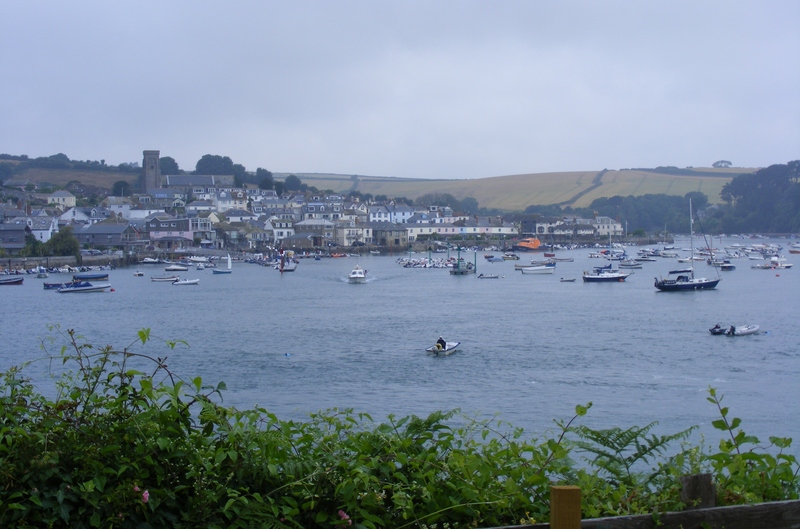 This section, 8 miles from Inner Hope to Salcombe, is described in our instruction book as ‘strenuous’ – deep joy. In the end it turns out to be less strenuous than anticipated and we even finish in 3½ hours – half an hour less than the books suggests. It is however very humid so we are soon ‘glowing’ nicely. Views are not on the menu with the thick sea mist. Unlike yesterday, we certainly do feel we’ve done something today. First port of call on returning to the site are the showers. I grab some clean clothes to put on afterwards. I am wearing walking trousers with detachable legs. Unfortunately, as I leave the shower, I realise I have brought the legs and not the shorts part. Not wishing to put on the less than savoury pair that I have just removed, now I am nice and clean, I go for wrapping a towel round me instead. I then have to nonchalantly saunter back across the site trying to make a bath towel look like a fashion statement. By the next day I am almost immobile again. Notwithstanding, we set off to walk from East Portlemouth to Prawle Point. This wasn’t the intended stopping point but there is an annoying diversion due to a cliff fall. I limp along personfully as my knee joins my back in the list of bits of my body that don’t work properly. We decide to call it a day and cut short our trip, returning to the rugged north. By this time even I am sick of the very long stretches of barely car width road. Glorious drive back across Dartmoor – even more glorious because I avoided the A38 this time. As I herd a flock of sheep with my car in order to make progress, I revel in how wonderful the Devon landscape can be. We are in the midst of a wonderful fest of family and friend visits but I am making time for history too. Another great day in the C17th with folk from the local care home and others, plus promoting Clovelly Archive Association at Woolsery Show and planning for the soon to be launched Buckland Brewer History Group. A is for AIM25 The website provides access to collection level descriptions of the archives of more than a hundred institutions within the London area. These include the records of London livery companies, higher education institutions and learned societies. B is for BARGES See also Boatmen, Canals and Watermen. From 1795-1871, all boats and barges exceeding thirteen tons burden used on inland navigations had to be registered with the Clerk of the Peace. Such records are with the Quarter Sessions (q.v.) records in CROs. Information on the history of the sailing barge can be obtained from the National Maritime Museum. The Society for Sailing Barge Research website is useful. A website entitled Thames Sailing Barges is also very informative and details a number of museums and other sources of information. C is for COUNTESS OF HUNTINGDON’S CONNEXION This was connected with the Methodist denomination. The Countess Selina (1707-1791) advocated the principles of Methodism and appointed George Whitfield, a notable preacher, as her chaplain. Her name was given to Whitfield’s followers. The Countess founded a college in Wales and built many chapels. The earliest register of this sect comes from Norfolk and dates back to 1752. The movement spread throughout the country. Registers were deposited with the Registrar General in accordance with the 1840 Act and are in TNA.